By now, most of us are familiar with the most popular health drinks that have worked their way onto supermarket shelves: green tea, green juice, kombucha, coconut water, and of course, good ol’ H2O. And all of those are great options for anyone looking to feed their bodies and fight disease. But though they currently have the spotlight, they’re certainly not the only health drinks out there—and they may not even be the most worthwhile. One of the most neglected revitalizing beverages in the mainstream is the South American equivalent of coffee. While the average North American crawls out of bed to grab a cup (or four) of Starbucks coffee, our friends below the equator leap out of bed and scurry to the nearest yerba mate bar. 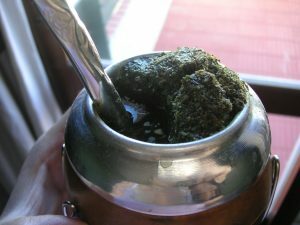 One survey found that over 90% of all Argentinian households polled consumed yerba mate on a regular basis. And, just like coffee, yerba mate comes in all sorts of flavor varieties (though admittedly, it’s doubtful that our South American friends drink gallons of pumpkin spice yerba mate in the fall). 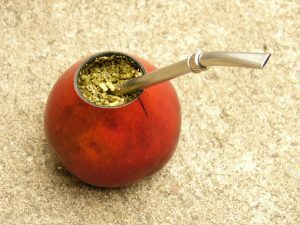 So, what IS yerba mate? It’s actually the name of a small, shrub-like tree in the holly family that is native to Argentina, Paraguay, and Brazil. The beverage is brewed like tea, using dried stems and leaves from the little tree. The flavor varies widely based on leaf-to-stem ratio, but regardless of whether your brew is pure leaf or pretty stick-heavy, it’s easiest to describe as similar in flavor to straight green tea. The high levels of tannins give the drink a strong, bitter flavor that tends to be an acquired taste for most people. Just like green tea! Since yerba mate didn’t woo the Europeans back in the days of rampant imperialism, many Americans haven’t heard of it, but that doesn’t mean it’s lacking an illustrious history. The locals already had a strong tradition of drinking yerba mate when Spanish colonists showed up. While the drink never made it back to Spain, the colonists themselves apparently fell in love with it—so in love that, in 1616, Spanish governor Hernando Arias de Saavedra forbid the entire population from drinking it. At the time, Jesuit priests (who were highly involved in colonization efforts) considered it to be a devious vice. One such priest bemoaned the tragic effects of yerba mate addiction, writing that when drinkers ran out of money to purchase it, they would “give away their underpants and their blankets,” and that if they were forced to go without it, “they fade away and say they cannot live.” That sounds like one heck of a caffeine addiction. In the end, money won out (of course), and the Jesuit priests established yerba mate plantations for profit at their missions into the late 1600s. When the Jesuits were booted out in 1767, these plantations were taken over by royalty and by private owners, who drove them into the ground with slave labor and massive environmental exploitation. For a long while after that, most yerba mate came from harvesting wild plants in Paraguay. It wasn’t until the late 1890s that successful yerba mate plantations were established again—and these plantations now provide yerba mate for much of the region today. Brazil is currently the leader in yerba mate production. It’s a shame that yerba mate never took off in most of the northern hemisphere, because this bitter beverage boasts a wide variety of health benefits. But that’s okay, because today is your lucky day: I’m going to share with you a list of the biggest health benefits of drinking yerba mate. 1. It boosts your energy in a way that is gentle and sustainable. Coffee junkies are all too familiar with the caffeine jitters and their ensuing crash, but yerba mate drinkers get a boost that is easier on their body and mind. Yerba mate is a stimulant, but it is far gentler on the body than its rivals, coffee, cocoa, guarana, and tea. This means that yerba mate drinkers get an increase in energy, wakefulness and motivation without suffering from anxiety, irritability or restlessness. This makes it an excellent drink for people who struggle with chronic fatigue during the day, and for people who need an energy boost but find that coffee makes them too jittery. This drink does contain some caffeine—about 85mg per cup, which ranks at more than tea but less than coffee. 2. It improves endurance and athletic performance. Runners the world over claim that they are fueled by little more than obscenely colorful gels and coffee, but if they’re looking to improve their performance, they may want to give yerba mate a chance. In addition to the caffeine boost that helps you power through your workout like Eye of the Tiger is flowing through your veins, yerba mate may help your performance in other ways. It is thought that yerba mate helps your body metabolize fat more efficiently during light to moderate exercise. This eases the transition between sugar-burning and fat-burning, which means you are less likely to ‘bonk’ and feel like a zombie in the middle of your workout. By encouraging your body to burn fat early on in the workout, you reduce the risk of completely depleting your glycogen stores and hitting the wall. 3. It boosts mood and creativity. While it probably would not be sufficient to treat severe depressive disorders, yerba mate may be the key to lifting your spirits on those days when you’re suffering from a mild case of the blues. In addition to the caffeine (which is known to fight fatigue and put a smile on your face), yerba mate contains moderate amounts of chemicals theophylline and theobromine, which work together to improve your mood. Unlike the anxiety-inducing stimulant caffeine, theobromine is actually a relaxing compound. This will help you feel alert, centered and focused. 4. It’s a natural multivitamin. A lot of the foods and drinks we regularly consume these days are nutritionally empty—but not yerba mate. Yerba mate is a lean mean vitamin machine with almost twice the antioxidant content of its cancer-fighting cousin, green tea. Every cup of yerba mate has high amounts of vitamin C, vitamin A, vitamin E, several B vitamins, iron, magnesium, calcium, sulfur, zinc, potassium, and manganese. It is also rich in health-boosting phytonutrients like chlorophyll, polyphenols, tannins, and amino acids. All of this is to say, if you’re looking for antioxidants, there is no better beverage than yerba mate. It’s a completely natural, whole plant-based supplement that will strengthen just about any dietary plan. 5. It can make weight loss easier. If you’re an ultrarunner or someone who has a hard time forcing down enough calories, skip to #6. If you, like most Americans, struggle to keep your body fat percentage down to healthy levels, listen up. 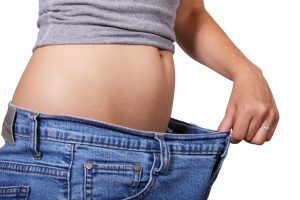 While it isn’t a magical diet pill, yerba mate may be a great tool for anyone looking to lose weight. As a mild stimulant, it serves to boost your energy and suppress your appetite, which makes it easier to take in fewer calories. In addition, it slows digestion and encourages your body to burn fat instead of sugar. If you’re trying to shed fat, the benefits there are obvious! 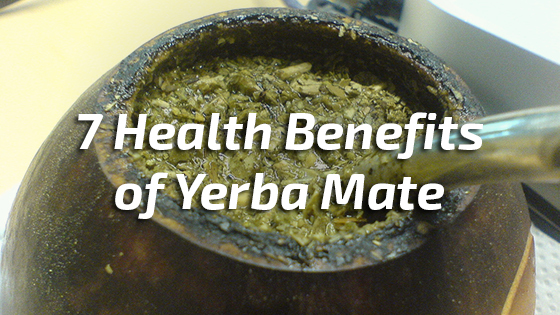 Add yerba mate to your healthy diet and exercise program. It may be the extra support you’re looking for. 6. It can protect against heart disease. Heart disease is the leading cause of death in the U.S., so we need any help we can get. Fortunately for us, yerba mate is an excellent heart-healthy beverage that may be beneficial for individuals struggling with low blood pressure, irregular heart rate, or even heart failure. It’s loaded with antioxidants and anti-inflammatory compounds that protect your cardiovascular system and promote healing. In addition, the theobromine opens up blood vessels, which improves circulation throughout the body. Any time you can improve blood flow, you’re taking the burden off your heart—which can save you a lot of trouble in the long run. 7. It may help fight cancer. More research is needed before your doctor starts prescribing yerba mate, but a handful of studies suggest that this super-drink may have powerful cancer-fighting properties. It’s chock full of known cancer-fighters like tannin, vitamin C, chlorophyll, and ursolic acid. One study even found that yerba mate was highly effective in destroying colon cancer cells in a test tube. Granted, this is a study done in a test tube, which is vastly different than the human body. Several studies have also shown that it has the potential to help prevent cancer from taking hold at all. However, a few studies done in Uruguay suggest that yerba mate may actually increase your risk of certain types of cancer, specifically bladder and esophageal cancers. However, researchers concluded that the problem was probably not the yerba mate itself, but how frequently it was consumed—as they say, the dose makes the poison (after all, even beta carotene has been shown to increase the risk of cancer in high doses!). Moderate yerba mate consumption will allow you to reap the benefits without the risks.